The gorge of Terradets lies in the west of Catalunya, between Lleida and the Pyrenees. Bruixes is a limestone crag with a little mixture of sandstone, thats why the holds have a dirty touch. There you’ll find more or less 50 routes between 6a and 8c+ but most are 7c+ and 8a. In general, the type of climbing is over tufas with moderate holds and overhangs with big jugs. Obviously there are also slabs with reglets and some pockets, anyway the crag is famous for it’s tufas. Pasta sin agua, 7a+. Polished start, is one of the typical routes to warm up. Little tufas and slabs. Jam Sesion, 7b (7b+ for some). Classical route which starts with tufas that precede long moves and finally a sustained vertical slab. Occident, 7c. Another classic crag’s 7c with a technical start tufa, jugs, overhang and an exit in juggy tufas with a boulder move over slopers. Energia Positiva 7c+. Continuity with tufas and a slab which ends with a juggy overhang. Orient, 7c+. Similar than Energia Positiva. Primera linia 7c+/8a. Tufas and a hard move on the slab. Efecte 2000, 7c+/8a. Big holds and a hard move on a one finger pocket. Latido del miedo, 8a. Polished as hell, continuity and tufas with the crux in the middle of the route. Anarkista, 8a+. Hard route, resistance over little tufas. Red Bull 7c+. Hard tufa route. It advances in diagonal. 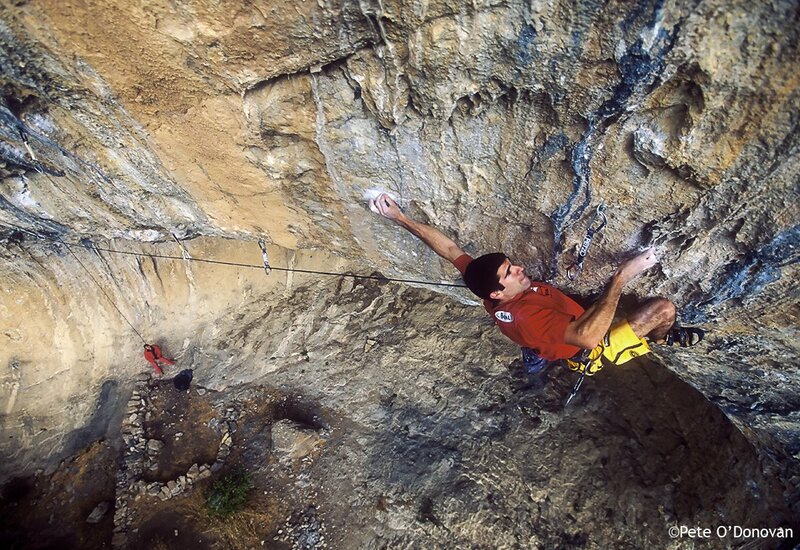 At this crag you can also climb combos of routes, like Definición de resistencia demócrata. The hardest route in the crag, 9a/+. It starts at Definición de acción, continues by La esencia de la resistencia and ends at Democràcia. More things: at the beggining of the crag there’s a super hard 6b+, then some crappy routes where we shall highlight a 6a+ or 6b with a very ugly bouldery start but so nice after it. You can climb at Bruixes all year because it’s faced south-west: In summer you’ll have to wake up early because the sun hits the wall at 12. It can be very cold in winter if the fog covers the valley. The ideal day to climb there is a cold and sunny day, shorts and no t-shirt assured! 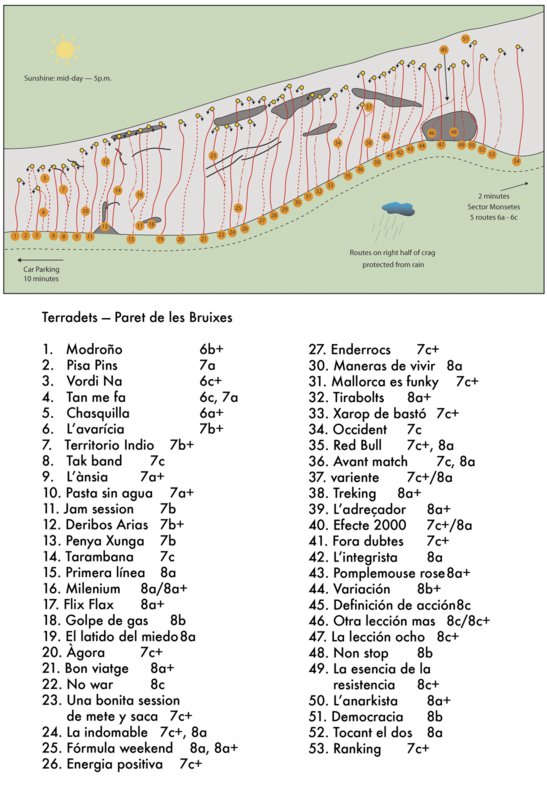 Click on the following thumbnail to download the Bruixes topo Pete O’Donovan did. Thanks to him for letting us use his pictures and topo. Thanks to Niall McNair for his picture of the crag and also thanks to Marieta for helping us performing this taste-menu. Tagged with Crags, limestone, lleida, sport climbing, taste-menu, winter crags. Hola, moja o seca rápido ?? Hi I am looking for a guide for Terradets or Montserrat..
does anyone know good professional guides?? please please I need one as I would really love to climb there. Hi Davis, it takes a long to get dry. Tufa’s are created because of water! Anyway, if you are an experienced climber, we can provide topos and suggestions of Montserrat or Terradets routes. Sorry, I forgot to put in the previous post.